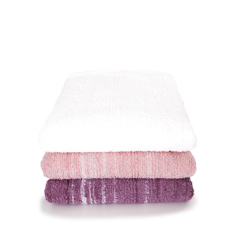 The towel surface shows a wave pattern made by the colorful variations of three different materials. The delicate shimmer of waves is woven into the methodically loomed base. This bold use of three different materials recreates the appearance of the Seto Inland Sea. Available in a variety of colors. Straits 220 is made using ecoface, an environmentally friendly decomposable polyester. Durable enough for regular use, under specific conditions of water, heat and micro-organisms, ecoface undergoes hydrolytic degradation, and is metabolized by microbes into water and CO2. 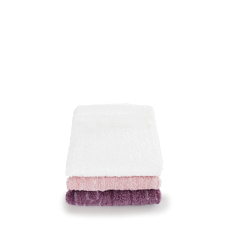 As polyester fibers do not absorb water, this towels maintains a dry feeling even straight after washing. 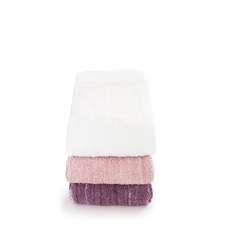 Straits 220 achieves excellent absorbency and quick drying by blending ecoface, bamboo rayon and organic cotton. The Best New Product Award, received by our towel at the New York Home Textile Show (now NY NOW) in spring 2002. Awarded to Straits Color Solid, the predecessor of Straits 220, the award recognizes the vast color variations achieved with lower environmental impact. Since then, Straits has maintained its popularity as one of our best sellers. Now, 20 years after its first release, it has been reborn as Straits 220. Portraying the wave patterns of the Seto Inland Sea with a bold combination of three different materials. 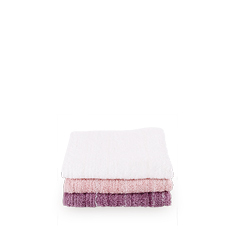 This 25cm square towel handkerchief fits easily in your bag or pocket and won’t get hot and sticky.